Published By – Oakfield Avenue Music Ltd. Published By – Edward Kassner Music Co. Ltd. Published By – Almo Music Corp. Published By – Crimsco Music, Inc. Published By – Stickguys Productions Inc. Published By – London Music Ltd. Published By – Milene Music, Inc. Published By – Opryland USA Inc. Published By – New Columbia Pictures Music, Inc. Published By – Colpix Music, Inc. Published By – Orange Bear Music Co. Published By – EMI Songs Ltd. Published By – Jet Music Inc.
Front insert is printed full-color matt half-tones on 240x360mm white sheet, 2-sided, with 3 folds. There are 30 track indices on the CD, which translates into 30 tracks. "Track -1" is a hidden track accessed by "rewinding" from the beginning of Track 1. Track 7.2 title incorrectly printed as "Silverscreen-Shower Scene". Track 16.1 is incorrectly credited to Interstellar. It's on the Pogo EP by Copyright. It was also released as Terranova on the Hitchhiking Nonstop With No Particular Destination album. Track 27 : Recorded at Echokammer Studio. V.Ponda [sic]/D.Child/P.Stanley are also credited for Production and Arrangement but this is not correct. Track -1 : EMI Music Publishing Ltd. / Universal Music. Track 3 : Metal Machine Music / Oakfield Avenue Music Ltd.
Track 9.2 : Almo Music Corp. / Crimsco Music Inc. / Irving Music Inc.
Track 12 : Deadarm Music / Almo Music Corp. (ASCAP) and Vibecrusher Music / Irving Music, Inc (BMI) Administered by Rondor Music. Track 17.2 : EMI Music Publishing Ltd.
Track 23 : Credits mention a fifth songwriter "S. Perkins". However, all databases credit only the four songwriters. 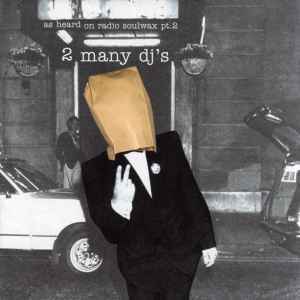 Track 24 : EMI Songs / Yet Music Inc.
Track 28.1 : Warner/Chappell Music Ltd.
"Apparently, the photographer of the original photos (taken at some wild parties in the seventies) showed up, threatening to sue 2 Many DJ's for using his pictures." All manner of silly behaviour ensued: have you ever seen crowd surfing and stage diving during a DJ set? A perfect mix if I ever heard one. At least until I found the secret Kylie Minouge track. Now that's just cheesy. I'll take Dolly Parton over Minouge any day.